In a unanimous opinion, the Supreme Court declined to issue a ruling in Zubik v. Burwell, the combined case dealing with religious exemptions to the Obamacare contraceptive mandate, sending the case back to the lower courts. The justices wrote in an unsigned opinion that they were not deciding the case on its merits, but rather asking lower courts to negotiate a compromise. 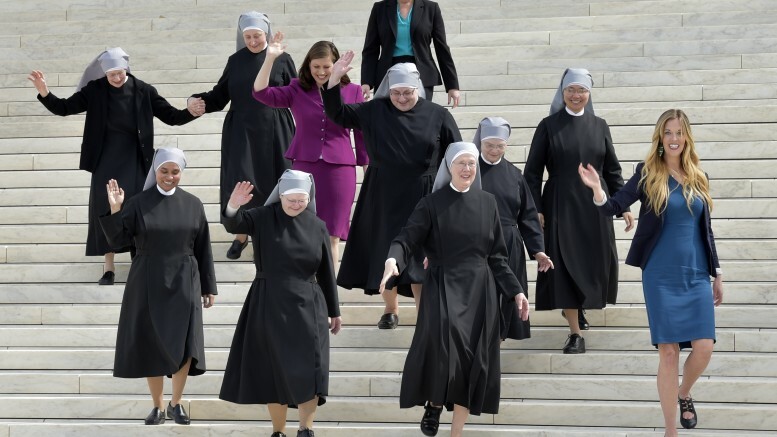 The decision vacates all lower court rulings, and also prevents the government from fining the Little Sisters for not complying with the mandate. “The Little Sisters deserve more than a victory in court. They deserve relief from this mandate, and an end to this ordeal. The administration should resolve this as soon as possible so the Sisters can go on serving the poor in peace as they have for so long. I am proud to stand with the Sisters, and all those who work every day to protect religious liberty. Since the Supreme Court did not issue a ruling on the merits of the case, there will likely be further legal action in the future. In a media conference call, Reinzi told reporters he didn’t know exactly what direction the case would take or what legal strategy the Becket Fund would pursue going forward.